Over the last two weeks I have been away from the Perth office working with a variety of our clients in Canberra on a range of projects. I thought I’d wrap up the last two weeks with a short blog post. My first task upon reaching Canberra on the 28th of September was to present about our work with the Atlas of Living Australia (ALA) and Museum Victoria on the Biodiversity Snapshots web site. 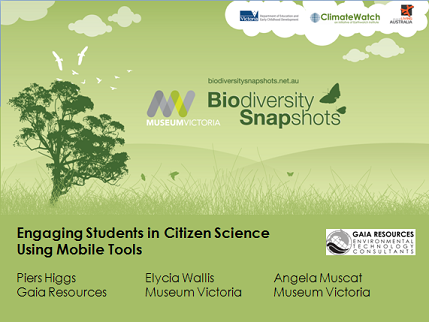 This site is the first of our citizen science portals that have been launched for the ALA, with a large amount of customisation to meet the requirements of the educational space. Anyway, I presented at the Australian Association of Environmental Educators conference, held at the Australian National University. My presentation is linked below as a PDF. I have a background in GIS and databases, and went to the education conference. I don’t think we could have quite got that more wrong if we tried. The rest of my trip was in Canberra, working with the Atlas of Living Australia primarily, where we did a review of where we are at with the citizen science work, in preparation for the launch of the ALA later this month. We also did a lot of planning for the next 18 months for this project – which will be great to continue to work in this area with such a rewarding project! I also took the opportunity to drop into a few other clients – the Australian Biological Resources Study group, who run the Bushblitz project (which we host and support on our server), and also the team at ERIN, part of the newly named Department of Sustainability, Environment, Water, Population and Communities. We work with the ERIN gang on helping them rationalise a few major databases, and also in using a data loading tool that we have developed for them to load data to these databases. Oh, and of course, if you haven’t already seen our blog post, I was also at the spatial@gov conference for a day or so, and picked up an award at the APSEA dinner for our work on the Climatewatch project. If you want to know more, contact me via email, Twitter, or leave me a comment to this post below.